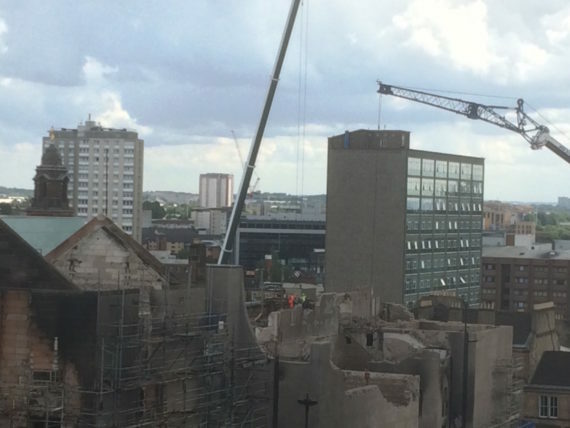 Work to stabilise Glasgow School of Art’s fire ravaged Mackintosh building is on schedule and is now underway on three sides of the building, according to an update issued by GSA. As well as the process of dismantling in order to make the building safe, remedial steel restraint strapping has been installed on the east gable so the existing scaffolding can be removed and replaced by new, shoring scaffolding. Using two cranes and two mobile elevated working platforms, work has also been continuing on the south and north facade of the building. At the west end of the building the existing scaffolding on the north facade, at the corner of Scott Street and Renfrew Street, has been cut away and reduced, enabling the removal of roof steelwork and RHS beams as well as more interior work. Work on making safe the neighbouring O2 ABC gig venue, also extensively damaged in the 15 June fire, has also been done. Commenting on the work done so far, GSA director Tom Inns said: “We are now three weeks into the stabilisation programme. Although there was some down time for the cranes over the weekend due to high winds making it too dangerous for the workmen, the down-taking remains on schedule. He added: “We are grateful to Glasgow City Council for stepping in to commission necessary safety works on the O2 ABC building. This will enable us to move the main crane to the corner of Scott Street and start work on the west end of the Mackintosh building above Sauchiehall Street. The cordon around the Mackintosh building is continuing to cause concerns for both local residents and businesses. A recent demonstration demanded access to properties, which they have not been able to enter since the night of the fire. 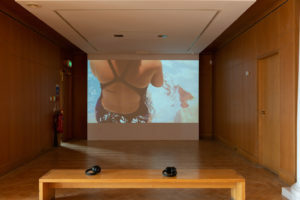 The nearby Centre for Contemporary Arts (CCA), which has entrances on Sauchiehall Street and Scott Street, has also been closed since the fire, displacing around 127 staff – 45 from CCA alone – from the 18 organisations based in building. 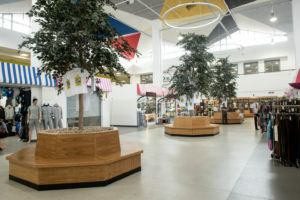 Shortly after the closure, two CCA-based businesses – Welcome Home and Aye Aye Books – launched Go Fund Me crowdfunders to raise money in order to keep the businesses afloat. Paragon Ensemble has also launched a crowdfunder due to its annual fundraiser at CCA being cancelled because of the fire. 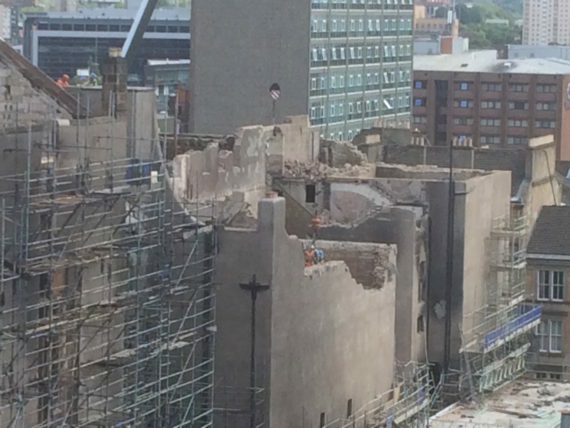 The current work on the Mackintosh building is scheduled to finish in around five weeks but there is no date set for the security cordon to be reduced. Due to safety concerns, any homes or businesses within the cordon – such as CCA – will remain out of bounds until the all-clear is given by the city council’s Building Standards department.